We really love visiting quirky little country towns and NSW certainly has plenty of them. One such place is Coonamble. Pronounced Coo-nam-bull, this tiny rural town has a population of around 3000 people. It features wide streets, old buildings and that slower pace of life that is synonymous with rural Australia. Coonamble is located on the Castlereagh Highway half way between Dubbo and Lightning Ridge. It sits astride the banks of the ‘dry’ Castlereagh River which divides the town in half. The river rarely has any water flowing in it, even though there is plenty of water to be found beneath the river bed. If you are interested in history, then a visit to the Museum Under the Bridge is a must. Located just off the main street, the building was formerly the Police barracks. The original Police stables are still there as well. Built in 1886, the museum is now home to an excellent collection of memorabilia. Items on display include the dock from the old Coonamble Courthouse, household goods, photographs, clothing and descriptions of the history of the area. The Museum is run by volunteers and entry is just a gold coin donation. 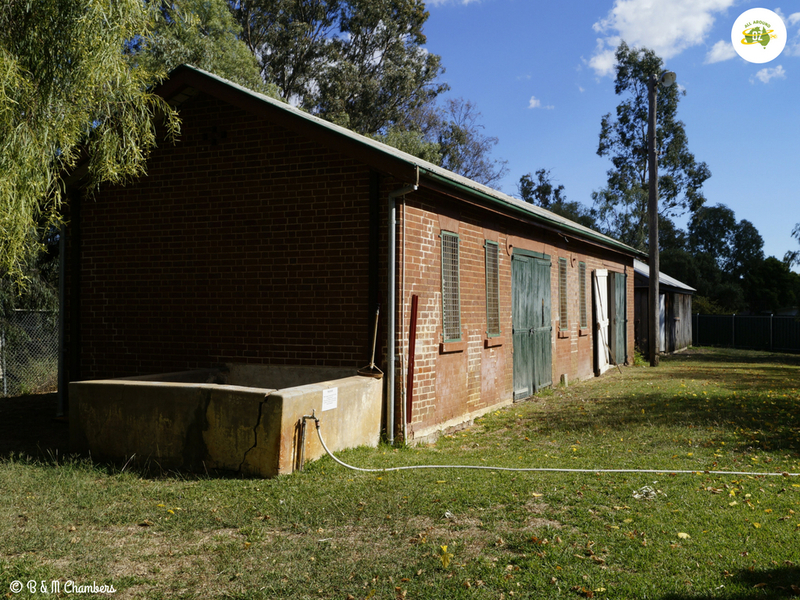 These are the original Police stables found behind the Museum Under the Bridge in Coonamble. The Nickname Hall of Fame is a fun way to celebrate the characters who live or have lived in Coonamble. Take a walk along the main street and you will find about a dozen caricature portraits. Each portrait expresses the particular traits and personality that each person was known for. You can ‘meet’ local characters like Tumbler, Ghost, Icey, Vanderbilt, Darla and Bricky. As nicknames are a very personal thing, it is not always known how people acquire their nicknames. At least for the folks of Coonamble this is no longer a mystery. 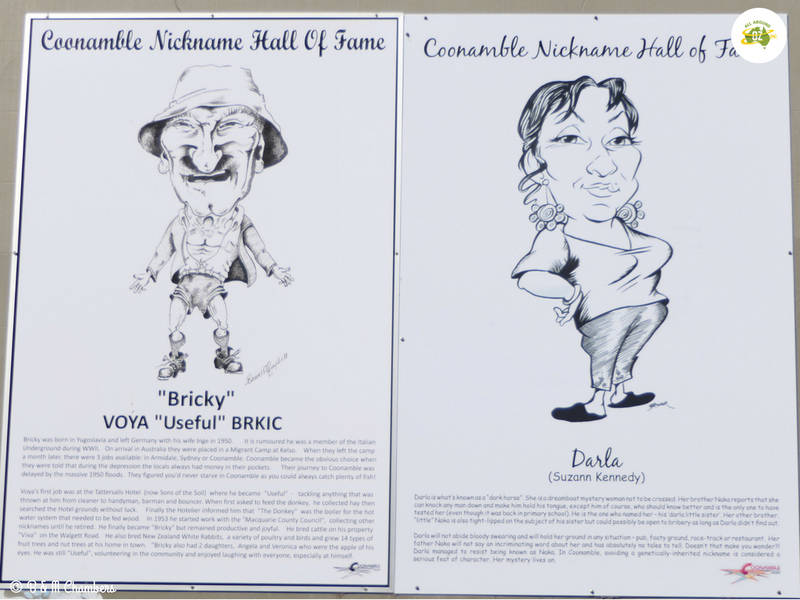 The Nickname Hall of Fame celebrates some of the characters of Coonamble. 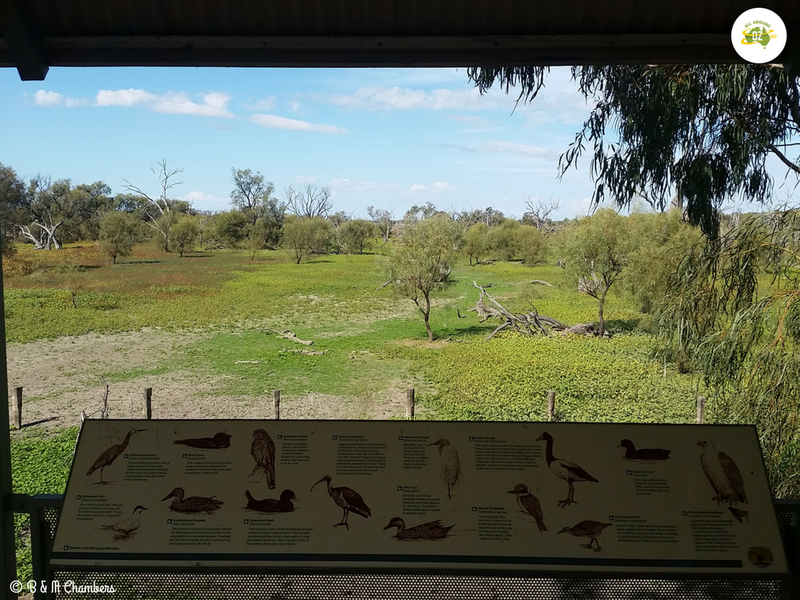 It is well worth taking the time to drive out to the Macquarie Marshes Nature Reserve. Even though it was dry when we were there, come the wet season the Macquarie Marshes comes alive with bird life. It covers an area of approximately 200,000 hectares and supports many threatened species of birds. The 90 kilometre drive out to the Marshes from Coonamble lets you appreciate the vastness of this country. It is mostly flat for as far as you can see and is also a dusty, gravel road to get there. Pack a picnic and fill your fuel tank as there are no services in the area. Macquarie Marshes is an easy 90 kilometre drive from Coonamble. About a half hour drive south of Coonamble is the little village of Gulargambone, which is an Aboriginal word meaning ‘watering hole for many galars’. We found a great coffee shop called Two Eight Two Eight where we stopped for morning tea. We then went for a walk through the park to admire the many ‘Galah’ sculptures. The caravan park in Gulargambone has an excellent reputation in travelling circles and it is definitely one we have put on our list for next time we are out that way. 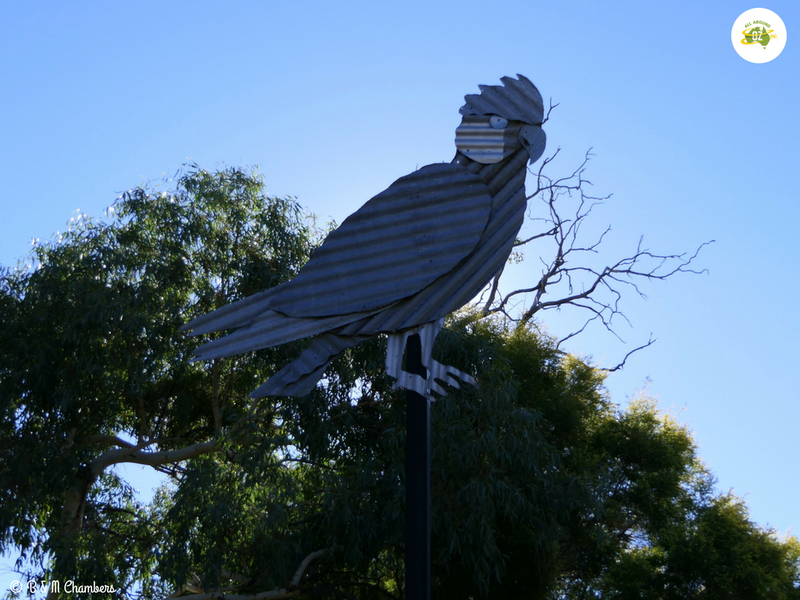 One of the many galah sculptures to be found in Gulargambone. We felt very privileged to be able to free-camp at Nakadoo Farm Stay. 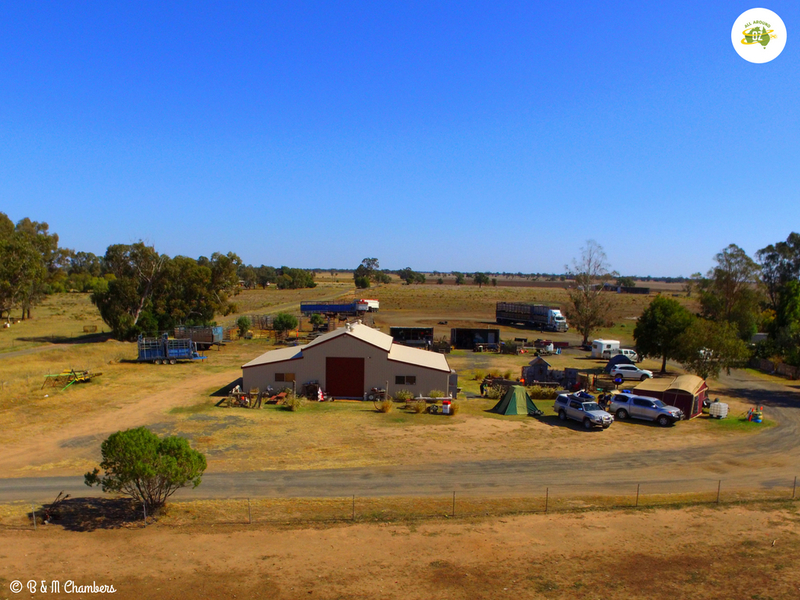 Nakadoo is a working farm just two kilometres from Coonamble and is owned by Karren and Naka. We set up close to the purpose built fire pit and enjoyed two nights sitting around the campfire and chatting with our hosts. Nakadoo is the perfect spot for kids and has an abundance of farm animals. Guinea pigs, rabbits, chooks, geese, goats and llamas all live in happy harmony. Nakadoo is the perfect place to stay at Coonamble. For more information about Coonamble you can visit the Coonamble Shire website. Have enjoyed reading this Melissa. I love little country towns too, so much so that we recently moved to one! I think that’s also why I love watching Back Roads on the ABC. Heather visits some places that look like they would have nothing going on in them, and uncovers amazing vibrancy. The great benefit of the way you are travelling is the ability to spend time discovering what these little places have to offer. Wishing you ongoing happy and safe travels! Thanks Jo. We do love to take the road less travelled. You just never know what you will find! I love little towns too. Sadly we haven’t done much travel outside of Sydney in NSW. One day we will eventually be able to take a ramble around. Happy travels. I’ve enjoyed meeting you today from Jo Castro’s blog. Thanks Jill. I’m sure you will get over this way one of these days.